DETROIT -- Volkswagen wants to combine Porsche Automobile Holding SE's sportscar business with its own and is looking at the possibility of using put-call options to achieve that, VW CEO Martin Winterkorn said. "The goal is to have an integrated automotive company as soon as possible," Winterkorn told journalists at the Detroit auto show on Monday. "We are already working with Porsche now, but that is just business at arm's length. We want to work with them like we do with Audi, Seat and Skoda," he said. Volkswagen last year said it would delay a merger with Porsche SE, which would have given it full control over the sports car unit, beyond 2011 because of legal issues. All signs point to a straightforward takeover of the 51 percent of the sports car business it does not yet own, which would involve the use of put-call options previously agreed between Porsche SE and Volkswagen. VW has been considering alternatives to a 2009 merger agreement after lawsuits in the United States and Germany complicated the valuation. Porsche SE holds a majority of common stock in VW, which in turn owns 49.9 percent of Porsche's automaking business. Winterkorn is seeking to integrate Porsche's lucrative manufacturing operation into VW to bolster his goal of surpassing General Motors Co. and Toyota Motor Corp. as the world's largest auto company by 2018 or sooner. Volkswagen expects a combination with Porsche to further boost profitability, with savings of 700 million euros ($889 million) projected from the integration. VW, whose other main luxury brands include Audi, Lamborghini and Bugatti, makes more vehicles in a week than Porsche does in a year. 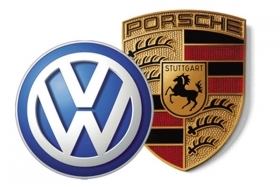 The two companies have been working on a full-blown merger since 2009, when Porsche failed in a hostile attempt to take over VW, the sports-car maker's biggest supplier. Porsche racked up more than 10 billion euros in debt from the effort. Short sellers of VW stock have sued Porsche in the United States, claiming it secretly piled up VW shares and later caused the investors to lose more than $1 billion. Claimants in Germany are seeking 1.1 billion euros in damages. Prosecutors in Stuttgart are also investigating suspicions that Porsche didn't adequately inform investors about its intentions to take control of VW. The main alternative to the original merger agreement is for VW, Europe's biggest carmaker, to exercise options to acquire the remaining 50.1 percent stake in Porsche's automaking business for 3.9 billion euros, leaving Porsche as a holding company for its 50.7 percent stake of VW's common stock. The drawback is that the options can't be exercised until Nov. 15, 2012, and would trigger a tax bill estimated by VW at about 1 billion euros, overwhelming the potential savings. The taxes would shrink to zero by the second half of 2014, according to VW.